A comment from David Farrar's KiwiBlog yesterday by "Ted Kennedy"
Some enterprising journo should do some digging and ask specifically what links Radical Youth has with Unite, the Greens, and the role played in RY by the likes of John Minto and Matt McCarten. 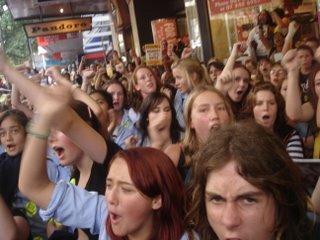 Radical Youth, who in conjunction with Matt McCarten's UNITE union, led 500 high pupils on an anti youth rates march in Queen St yesterday, are basically the youth wing of Global Peace and Justice Auckland. GPJA is led by John Minto and long time Marxist-Leninist Mike Treen. It groups several radical strands and has close ties to the Greens, Alliance, Socialist Worker and the Socialist Worker front "Workers Charter Movement". It has people in several high schools in Auckland, including in the newly formed students union at the revolutionary hotbed of Epsom Girl's Grammar. A Palestinian, Omar was at Takapuna Grammar last year. He is active in the radical, Auckland Uni based, Students for Justice in Palestine. He was a friend of Harmeet Singh Sooden, currently (still alive, I hope) being held hostage in Iraq. He was listed Socialist Worker's "Unity" of September 05 as endorsing the "Workers Charter". Currently studying sustainable horticulture at Unitec, first became involved in activism when he attended a GE-free march with his brother. The 17 year-old then started taking part in actions focused around issues, such as the invasion of Iraq, genetic engineering and climate change. He also joined Greenpeace and the Green Party. He was Nandor Tanczos' rep in the last youth parliament. thanks Trevor - I've just learned a lot more about RY from you than I did through the MSM. The MSM are scared to investigate left wing groups lest they be accused of adopting a McCarthyite mindset. The subjects of McCarthy's investigations are martyrs to modern journos - see 'Good night and Good Luck'. Media's fear of being labelled McCarthyist has given the left a free ride for years. "Currently studying sustainable horticulture at Unitec, first became involved in activism when he attended a GE-free march with his brother. The 17 year-old then started taking part in actions focused around issues, such as the invasion of Iraq, genetic engineering and climate change." "John Darroch, currently studying sustainable horticulture at Unitec, first became involved in activism when he attended a GE-free march with his brother. The 17 year-old then started taking part in actions focused around important issues, such as the invasion of Iraq, genetic engineering and climate change. Through his brother he became involved in Greenpeace and the Green Party." To Ted, you're 100% right. The left gets away with heaps of scams because the MSM would rather die than risk being labelled McCartyist. The term MCCarthyism was incidentally coined by the Communist Party USA's People's Daily World. The other thing about McCarthy that his main mistake was understating the Communist infiltration of the US government. You're doing the job that should be done by our newspapers, were there absentee owners uninterested in what's going on in New Zealand. Consider the acreage of coverage in the Christchurch Press -- Minto's long, raving columns and the vast, euologistic piece on Lalle Harre, without telling people about Nicaragua and her Marxist ideology and activism. Whoops in the above comment, I meant to say about our newspapers: were their owners NOT uninterested in what's happening in New Zealand. Haha this article and all the others that I've read that I know about on your blog just further prove how stupid and uninformed the right wing of NZ is. you really have no idea. You can dig as much dirt as you like, but really it has nothing to do with real left wing politics. thanks for entertaining anyway.